Being a 40's/50's girl myself, I don't usually find myself having a large collection of 20's-30's clothes. 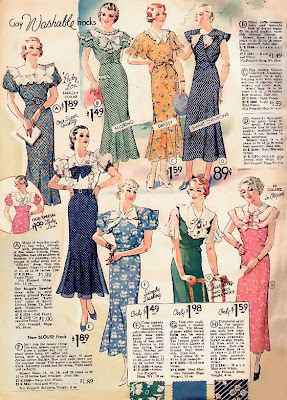 If by chance I do, they are all evening dresses. Not quite appropriate for the Gatsby summer picnic, since it is during the day and we are literally picnicking - on a blanket, on the grass. I'm thinking that I will be stuck making something since what I dream of wearing I either: a) won't be able to find in 3 weeks time, b) doesn't exist in wearable condition anymore, c) even if I did find something along the lines of my dreams would probably never fit me. So that leaves me with yet another project, in mustard yellow and cream for me to complete...asap!